*This review contains a spoiler for the ending of the film, but it is clearly marked! Pippo Popolino (Bob Hope) is a miserable tailor’s apprentice living in Italy in the mid-18th century. He wants to woo the widow Francesca (Joan Fontaine), and to do so decides to dress up as Italy’s most notorious ladies man, Casanova. He quickly gets found out by Francesca and the real Casanova (Vincent Price, in an uncredited cameo), much to his disappointment, and doesn’t win over the lady. But a form of luck soon comes to him. The real Casanova decides to skip town and asks Pippo to pose as him – but the reason the real Casanova needs to leave is because he owes money to just about everyone (including Francesca, who sells groceries). Pippo readily accepts the impersonation scam but doesn’t know exactly what he’s getting himself into. At the same time, Casanova’s creditors realize that he’s gone and are devising an impersonation plan on their own. 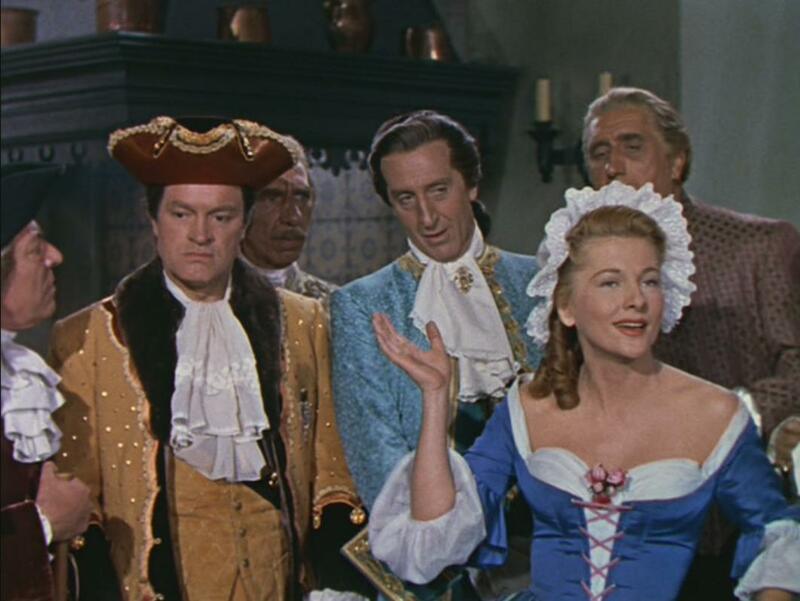 The Duc and Duchess of Castelbello have showed up at Casanova’s house with the intention of giving him a whole ton of money if he agrees to woo an engaged lady named Elena (Audrey Dalton). Luckily for them, Pippo prances into the house in costume and accepts the deal. So off they go on an adventure – Pippo, Francesca and Pippo’s “valet” (Basil Rathbone) – to steal Elena’s petticoat and get the money. 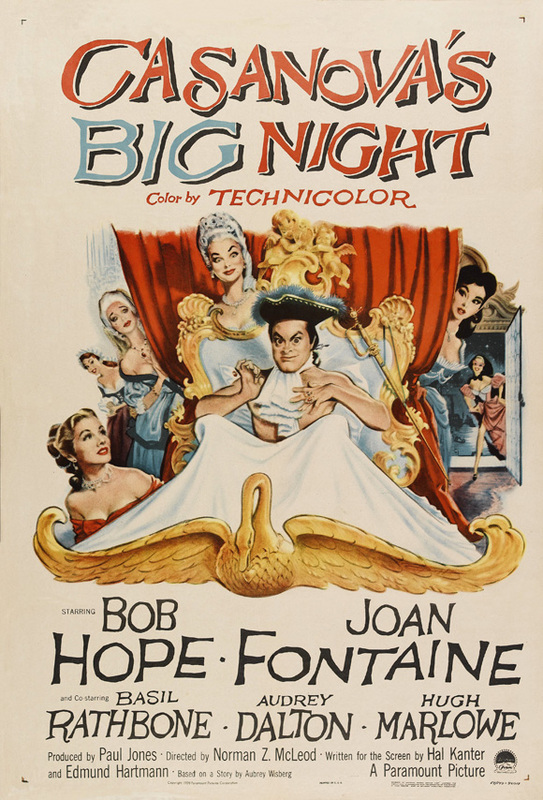 Norman Z. McLeod directs the adventure comedy Casanova’s Big Night. The script was penned by Hal Kanter and Edmund Hartmann, based on the story by Audrey Wisberg. Running gags: Pippo constantly fixes loose threads on everyone’s clothes; His hat always falls off (and he catches it) each time he bows at someone. The film sometimes feels like it’s trying too hard to be funny, but overall it does actually bring a lot of laughs. The plot has potential for drama, but that potential is overshadowed by the comedy, so the more dramatic moments are hard to take seriously — the viewer wants to keep on laughing. This comedy of quest and error is fast-paced from the very beginning. Not even five minutes pass before it jumps right into the action, and there are no dull moments. Bob Hope is obviously meant to be the star here, and he shines. He does a great job of showing just how different Pippo is from the “Casanova” persona, which always brings on the laughs. When he tries to wear that persona to woo Elena, win sword fights or do anything Casanova-ish, it’s very obvious that he’s putting on a show, which is hilarious. The supporting cast is great, too. Joan Fontaine does well in her comedic role, as does Basil Rathbone. 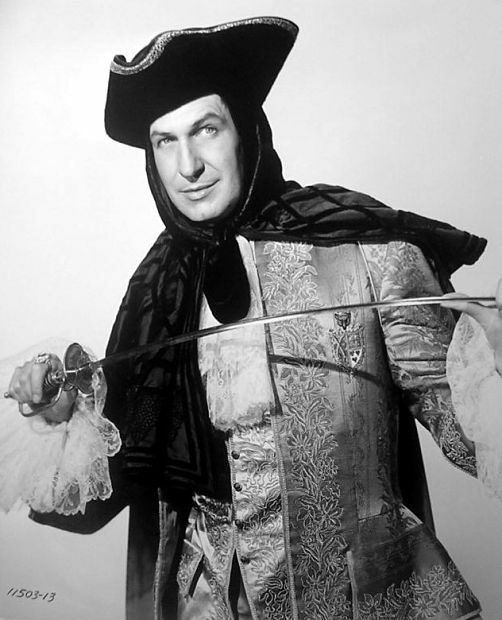 Vincent Price is amazing in the small role of Casanova. He’s remembered for his work in horror/thriller films, so it’s always fun to see him in different characters, even though his role here is quite small. Hope is still the funniest and most captivating part of the film, but all performances are well-executed. Above all of the funny moments and great performances, there was one aspect of the film that I found most interesting: the ending. *SPOILER TIME* Hope directly addresses the audience, saying that Paramount wants his character’s head cut off but “Bob ‘Orson Welles’ Hope” wants a happier ending for his character, which is then shown to the viewer. Ha ha – the ending sounds great! I’m glad you included it in your review. I usually try not to spoil anything, but I had to talk about that ending! I don’t think I’ve ever seen anything like it before. It was so great.